The latest Jerusalem Strategy Gaming Club session report is up. Games played: Solomon's Stones x ? ?, Saikoro x 3, Notre Dame, Power Grid - Central Europe. Solomon's Stones and Saikoro are new abstract games that were sent to me by a publisher. We particularly enjoyed Saikoro. I will write up some reviews asap. Tonight and tomorrow is Holocaust Remembrance Day in Israel. Rachel and I attended a literary evening of poetry and prose at the Shaindy Rudoff Graduate Program in Creative Writing at Bar Ilan University. Shaindy founded the program and began organizing these events five years ago. She died (young) of cancer two years ago. So this was the second of these events that was subtitled "in memory of Shaindy Rudoff". On hand were a number of speakers, including the poets Gerald Stern and Peter Cole, and the authors Tamar Yellin and Nessa Rapoport. The guest of honor appeared to be Gerald Stern, an oft-awarded American Jewish poet. He's not quite beat, though he comes from that generation, but he's plainspoken, funny, poignant, and sharp. Before the proceedings, the attendees mingled among hot drinks, soft drinks, and cheap pastries. An air of snootiness permeated the place. I don't know exactly why that is. I don't get that feeling before other cultural events, such as musical events, plays, dances, or anything else. Something about a reading. When people talk, you can feel the class judgment radar beeping. People seek out people of higher literate standing and try to ingratiate themselves. Everyone is dressed like a bohemian or a professor. Half the people stare around the room from the sidelines evaluating prospective conversations; they nibble their pastry or sip their coffee. The other half talk up authors or professors, or bask in being talked up. Conversation consists of praising your partner for his or her work, asking simplistic questions that will allow the author to talk about himself, or exchanging contacts and suggested reading lists. An older gentleman came up to Rachel and said hello. Rachel introduced herself, but before she could introduce me I said, "I'm Yehuda Berlinger, author of 'Last Chance to Procreate' ". "Ah, yes" said the gentleman, with an intonation that of course he has heard of it, obviously trying to decide whether he could fake his way to claiming having read it. Unfortunately, my wife shoved me and told the man to ignore me. She was a little embarrassed. Can't say I blame her, but I told her afterwards that she would have been less embarrassed if she had had the presence of mind to just go along with it. In the end, I was the one who was embarrassed, because it turns out that the old gentleman was Shaindy Rudoff's father, and so was probably not disposed to being made a fool of, even for a few seconds, at a memorial lecture given for his daughter who had died of cancer. Rachel banished me to the corner where I read my book  until the proceedings began. Luckily, I enjoyed the readings, so it was a good night after all. Literally made up in a split second. I'm rereading Ulysses by James Joyce. Sometimes I'm in the middle of longish posts, so I don't post as frequently here. And sometimes, in the middle of a longish post, I end up not liking the post, so you don't even get that as consolation. I'm in the middle of evaluating one such post right now. I'm off to an interview this afternoon, and I have a follow up interview next week for the position for which I interviewed last week. Both in technical writing, both on the other side of the country. I did this daily cross-country commute for a year and a half, so I know I can do it, but it can get to be a drag. At least one of the companies already hinted that I could work from home one day a week (if they offer me a position), which would be a big plus. Aside from the game groups mentioned last week, I played a two-player game of Puerto Rico with Rachel, a three-player game of Puerto Rico with Rachel and Nadine, and a game of It's Alive with Tal. I won the two-player Puerto Rico game against Rachel by around ten points. She has been beating me around 6 games out of 10; but on turn three I already saw myself falling into the same kind of pattern that usually loses the game. Namely, not enough production. So I declined a quarry on turn three and instead went for another plantation. I think it helped. In the three-player Puerto Rico game, I lost 45 to Rachel's 56 and Nadine's 57. Both Nadine and Rachel made some early moves which killed my early trading potential. I ended up with a coffee monopoly, but only in the late mid-game. Enough to buy an extra building or block a boat, but not both. I opted for the boat. Nadine meanwhile had tobacco both on the boat and trading house, and a working Factory as well. Rachel had great shipping, just shy of the difference with Nadine's second building. In my game of It's Alive with Tal, I lost big time, too. I think I had 5 tiles when she completed hers. I couldn't tell you what I did wrong. We both had roughly the same number of Villager attacks. And I think I got more of the coffins. The timing was just bad for me. Passover is now over (one more day for those of you outside of Israel), and our kitchen is nearly back to normal (I'm being truant by writing about it instead of helping finish the last work in the kitchen). Game night can't happen on Wed night this week as it's Yom Hashoah, or remembrance day for the Holocaust, so I'll have to move it up to Tuesday. Add a little Zen to your life with my original list of Gaming Koans. Can you match the taglines to the correct game? In my synagogue, the same thing happens every kiddush. On the problem of evil. The latest Jerusalem Strategy Games Club session report is up. It was Games Day at the JSGC. Games played: Amun-Re x 2, Anagrams, Bridge, Cities and knights of Catan x 2, Colosseum, Cosmic Encounter, Go x 2, Magic: the Gathering x 5, Pirate's Cove, Power Grid, Puerto Rico, Race for the Galaxy x 4, R-Eco x 4, Robo Rally x 2, Santiago, Settlers of Catan, Shadows Over Camelot, Winner's Circle, Year of the Dragon. A record attendance of 32 people over the course of 13 hours of play. The BSBGC is run by Avri who first came to my group once or twice and then set up his own, something I never managed to successfully do when I lived in Beit Shemesh. When I arrived around 7:00, I figured I would stay for a game or two. There were around 10 to 12 people there, half of whom were smack in the middle of a game of Robo Rally. I own nearly all of the games he owns as well, so I wasn't keen on playing any specific game. I found one woman who had been hanging out all day but not playing anything. She didn't like to play most games, but she had played Hearts on the computer. I managed to convince her and two others to give Team Hearts a try. Team Hearts is far superior to regular Hearts. You always pass to your partner, and you win or lose as a team. Shooting the moon still has to be done by an individual, so you can block someone from shooting by giving his partner a point and still not take any yourself. The woman found even this to be too trying, and conspired to get someone to take her place midway through the game, so we ended up finishing without her. I believe the others enjoyed it. My team won (no surprise, as we used passing signals and our opponents didn't) 63 to 119. Zooloretto is the most celebrated family game from last year, earning 14 or so awards including the coveted German board game of the year (Spiel des Jahres). It's a thematic game based on similar mechanism from a 2003 card game Coloretto by the same designer. Each player has a zoo with three pens. Each pen can hold between 4 to 6 animals. In the center of the table are trucks, one per player. Each truck has room for three tiles. A bag of around 100 tiles contains animals of seven or eight types, money, or concession stands. Each turn, you a) take a tile out of the bag and put it onto a truck, or b) take a truckload of items and try to fit them onto your board, or c) pay money to rearrange your board. Once you take a truck, you can't take any further actions until all players have taken a truck as well. After everyone has taken a truck, all trucks are returned empty to the center of the table and the game continues. The game ends roughly when the tiles run out. Each pen can hold one type of animal. Any additional animals you have go into your barn and score negative points. Money can be used to swap animals, discard unwanted tiles, buy them from other people's barns, or add one additional pen to your zoo. Concession stands can be placed next to a pen, one per area. At the end of the game, you score points for complete pens, or half if you're shy just one animal. Otherwise you score nothing for the pen unless you have a concession stand next to it, in which case you score one point per animal in the pen. You also score two points for each different type of concession stand you own. And lastly you score negative two points for each animal in your barn. There are a few other rules, such as a free baby animal when you have a male and female animal. It's a decent enough game, with pretty artwork and some light theming. It's also pretty easy for families to play, although given the male and female animals and their mating habits, it might be more fun in an adults-only environment. Still, as often happens, I don't think it's so darned good as to have earned so many accolades. In my game, I managed to avoid any negative points, but my timidity prevented me from scoring better with the pens and concession stands, so I didn't win. Looking for something light to flush the brain cells between games (not that Zooloretto could be considered heavy), I was astounded to discover that no one there knew the game Pit. Pit is over 100 years old, and, I thought, a staple of American households. I taught them using the resources from games of Settlers and C&K of Catan. It was a HUGH hit. Games last typically less than a minute, and they wanted to keep playing again and again. Avri in particular broke out in helpless laughter a number of times. One of the other players wanted to play nothing else for the rest of the evening. I saw a Puerto Rico game starting for four players and cajoled my way into being the fifth player. This was probably a mistake. I don't think I've ever felt quite so embarrassed during or after a game. I discovered early on that my opponents were all fairly inexperienced players. By the time I discovered this (turn 2), I didn't want to leave the game, and didn't want to play poorly just to even up the chances. I just played a straightforward game. By mid-game they were taking bets on how big the spread would be between my winning score and second place. Some of them went to far as to say 20 points. In the end, I had 64 points and second place had 40. I had started in fifth position, and had no quarries, an early coffee monopoly, an early Factory and then a Wharf. I also pulled Guild Hall and Custom's House by the end of the game. the guy next to me bought Large Warehouse, a building I tend to avoid. But with his Large Indigo and Large Sugar, it actually came in handy for him and netted him 7 additional shipping points near the end of the game. As Saarya's last game, he taught a few people how to play my game It's Alive. From what I was hearing, they were confused during the explanation and throughout the game. As a result, they weren't terribly enthusiastic at the end (some more than others). Oh well. Can't win them all. Smart Zone is an Israeli game publisher/distributor run by Tzafrir & Tali Kazula. They distribute Tantrix, Pentago, and Hive in Israel, and Tantrix Hive to America through a sister company. In addition, they have produced a few original games and are looking for more submissions. Tantrix is a worldwide successful tile-laying game. The game contains 56 Bakelite tiles with lines of four different colors. In turn, each player picks and plays a tile from the central pile. The object is to create the longest line in your color. For more information or to play online, visit the Tantrix web site. Pentago is a simple abstract game. You place a marble and then turn one of the blocks, trying to get five in a row. For more information, visit the Pentago web site. 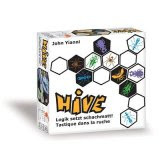 Hive is another abstract tile laying game which has also received some success and accolades. Each player has 11 Bakelite tiles with bugs on them. 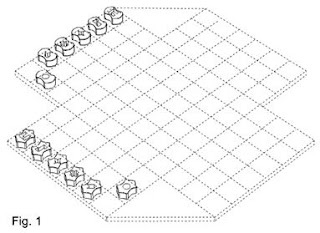 In turn, each player plays or moves one of their tiles in an attempt to surround your opponent's queen bee. I've played Hive and it's an excellent game. It's on my list of great buys for new players. This is the third edition of Hive. The first two used wooden tiles with stickers; the Bakelite tiles are far nicer. When I sat down with Tzafrir & Tali on Tuesday, they told me that it was their convincing that got the designer to change Hive to Bakelite tiles for the third edition. They are a nice couple with the usual small game publisher enthusiasm. They have had some success, as the games they are distributing will attest to. Smart Zone is working on changing its focus from game distribution to game publishing. To that end, it has published games by both Tzafrir and his brother. I played one of these games, called Battle of the Pyramids. An appropriate game for a Passover afternoon. BotP is a Stratego variant. You have a large and flat rectangular board with squares, but the squares are turned on their corners into diamonds. So you have a rectangular field of diamonds. Your nine pieces start on your side of the board and can move along the lines of the compass. The object of the game is to be the first player to get seven of your pieces to the other side of the board. The pieces come in different colors, and some lines on the board are designated for each of these colors. When a piece is on a line matching its color, it can move as far as it wants along the line. Otherwise, it moves one space. Each piece also has a different symbol. When your piece has reached the far side of the board, it is removed from play and placed on the spot matching the symbol on your side of the board, both as an indication of your having reached the far side with that piece, and to block one spot on your side, lessening the available spaces on your side. Each piece also has a number power, like Stratego. The pieces separate into two parts, so you can assign whichever number you want to whichever piece before the game starts. When you clash pieces (simply by moving adjacent), the lower number must retreat to a designated location on his side of the board. In the case of a tie, both pieces retreat. Lastly, you have two bombs which you can hide inside two of your pieces. When you clash, if your piece contains a bomb, the other player's piece is eliminated from the board along with your bomb. Your piece remains, without the bomb. After one play I could see that you want your "9" piece circling around killing other pieces as they try to get to your side of the board. So you leave that piece as the last one to leave the board. There is one "retreat" position that essentially controls your side of the board and it lies on crossing blue lines. If you choose your "9" to be a blue piece, then whenever it retreats, it retreats to the perfect place for defending. My opponent found it very difficult to pass me as a result. It's an interesting game. It plays quickly, although careful defensive play might extend the game's play time. As you succeed in moving your pieces to the end of the board, you lose them, which gives a natural advantage to the losing player, keeping the game balanced and allowing the loser a possibility of catching up. The theme is essentially non-existent. But the game's biggest problem lies in it's physical design. Some of the colors are hard to distinguish, even for non-colorblind players. And the tiny symbols on the pieces are all very similar, which makes learning which piece goes to which location very difficult. I kept getting them confused, and in fact lost the game by confusing two of the symbols. It's an inexcusably bad problem. The game looks like it's "finished", so I don't know if my telling them will effect any change. Hopefully what they showed me was a prototype. Or perhaps they can create a second edition with less color dependence and clearer distinctions among the symbols. Just to add insult to injury, I wasn't particularly enamored with the box design, either. The board looked nice, however, and the game appears to be playable. This is a 1-player puzzle game also created by Smart Zone which was quite enjoyable. It's very much in the same space as Rush Hour. 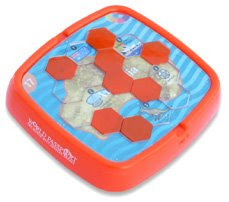 The game comes with six plastic pieces, each of which is a hexagonal triomino or hexagonal tetramino. On each piece, one or more of the hexagons is opaque. The game also comes with 50 40 maps of countries. Each map has five locations marked. For each map, you must place the pieces so that there is a clear path leading from the first location through each other location (in order, so no branching). The lower numbered puzzles give you clues as to where to put one or more of the initial pieces, while for the higher numbered ones you're on your own. It's quite clever, and comes with a booklet containing all the solutions. Of course, once you've done all the puzzles the game is done, just like Rush Hour. 1. we are the distributors of hive in the USA and not Tantrix. 2. in our game world passport we have 40 maps and not 50. Hiking in America is a marginalized activity. People go to beaches, parks, and backyards, but hiking is a niche activity for Hippies and sport freaks. It may be because people in America live so far from accessible hiking trails, or it may be that America is so vast that hiking one small part of it doesn't feel like much of an accomplishment. Or it may be that there are so many other activities to do, or so many beautiful places to find that don't require hiking. In Israel it's a different story. Israel is a small country. Every inch of the country is criss-crossed with hiking trails, color coded on maps and on the trails themselves. Every few hundred meters - or few kilometers in sparse areas such as the Negev - is the start, end, or crossing of another trail. To follow the trails, you look for the special three painted color stripes that adorn rocks, trees, and signs along the trail. Some hikes are trivial, flat, and short. Some are rough, steep, and wild. A few trails cover the entire country from one side to the other. Israelis use these trails. Youth groups, high schools, day schools, communities, organizations, and tour groups can be found all year long walking, climbing, wading, and resting along these trails. Around the holidays and vacations, the trails get crowded with hikers. Sure, we also hit Israel's beautiful beaches and parks, zoos, museums, malls, wineries, sport stadiums, and so on. But hiking is the national pastime. It may have something to do with the compulsory army service, in which you are going to be hiking a lot anyway. Or that we are constantly under threat, and this is our way of loving every inch of our land. Or that the trails are not far from us, or that we still internalize the sense of pioneering spirit. Or that every hill and valley in Israel is rich with the history of our people. Rachel and I spent yesterday hiking near Ela junction, on a hill where a certain type of lupin grows only for a short time each year (we missed the time). It's also the hill on which David stood facing Goliath right before their climactic battle. The trail is littered with ancient caves, olive presses, and the occasional mosaic. It was hardly a great hike: little shade, no water, the flowers already gone. Even so, the views were nice, as was the company (we went with our shul). And the sense of belonging: this is my land and I'm walking it. Today I'm driving 45 minutes to an interview in Petach Tikve. 45 minutes from Jerusalem is essentially coast to coast; I'm crossing nearly my entire country in a car ride. So happy Earth Day. Go out and walk your land. Your country. Your planet. While you still have it. I created this game in the last few minutes before Passover began (actually, before shabbat began). I make three sets of papers: personalities, items, and books. There was one paper in each set for each of my seder participants; we were twelve people for seder, so I made twelve personalities, and each personality had a corresponding item and book. I shuffled these up and gave one paper from each set to each of our participants, i.e. each person got one random personality, one random item, and one random book. During the seder, if you touched your nose or ear you were to speak as if you were the personality on your paper. The object of the game was to return to the correct personality their item and book. So you not only had to figure out who was who, you also had to figure out which item and which book belonged to which personality. This was last minute, so some of these could be better, and some items could belong to more than one person. But you get the idea. In any case, the game went over pretty well, so there you go. Yocheved's husband wanted to separate from his wife so as not to produce any babies. Miriam watched Moses in the Nile from afar. Aaron had many clothes as high priest. Tzipporah needed this to chase away shepherds at the well. To put onto his strong hand and outstretched arm. Yitro heard about what happened to Israel in a distant land. Serach was very old and knew the correct code words that would identify a real savior for the Jewish people. I neglected to let you know that our dog Ginn arrived back in Israel with Rachel without incident. This may not seem like an interesting tidbit of information to those of you who don't know Ginn's travel history. I would like to share another piece of information about Ginn: she's not a religious Jew. In fact, I think she's an anti-semite. I could have realized this a year ago. I bought a new tallis for myself and gave my son my old one. That very day I went out, and when I returned home, Ginn had jumped on the bookshelf, pulled my tallis down, and chewed several mouth prints out of it. But I let this incident go. I shouldn't have. Apparently, a week or so ago Ginn did the same thing to my step-son's tephillin. Now, tephillin are very hard leather boxes covering sacred ritual scrolls. They're pretty hard to damage. You are not supposed to drop them onto the floor; if you do, you pick them up and kiss them. To protect the boxes from scuff marks, they are kept in hard plastic outer boxes and stored in a cloth bag. Eitan kept the bag on top of his dresser in his room. Ginn was left in his Eitan's room when he had to go out, but he never suspected that Ginn would be able to get this bag; he never had until then. Ginn managed not only to get the bag, but to chew through it, unwrap the plastic boxes, chew through the leather down to the parchment. She then chewed up the parchment and vomited it up in several places around the room. I could only imagine them taking the parchment to a sofer stam and asking him to fix it: "It's here ... and here and here and here. Just let me wring out the dog saliva and vomit." And unlike us, she eats kitnyot on Passover. P.S. BTW, I think I was supposed to write "sin" (not "cos") in that picture. Passover is Saturday night/Sunday, so I will be out of communication until at least Sunday night. If I were living in the US, it would be until at least Monday night. The house is all cleaned of hametz, and spring cleaned as well. The cooking will be finished today. The guests are invited and all bringing stuff. My kids are with me this Passover, and Ariella, my step-daughter, is also with us, unexpectedly allowed to leave her officer training program in the army for the weekend. Games and divrei torah are prepared. Let's have a seder. Rachel being back means that Nadine and Rachel and I can resume our weekly Puerto Rico games. And whenever Tal is around, we play It's Alive or card games a lot. I have a number of posting ideas, but they all require more research than I'm willing to expend after all my Passover preparations. So I'll just say: have a good seder (if you have one), and I'll see you on the other side. P.S. Some movies I've seen recently that I recommend: 10 Items or Less (quirky and entertaining), Atonement (lovely), August Rush (if you can suspend disbelief, in the mood for the mythic, and are very sentimental), The Bourne Ultimatum, Closer (unbelievably good), Donnie Darko (weird), House of Flying Daggers (like CT,HD), The Jane Austen Book Club (lovely), Once (if you're patient and realize that it's a musical, it's brilliant). What your color choice of game piece means about you. I've got a few interviews lined up for tech writing positions. I could and should be pursuing additional corporate blogging positions; why aren't I? I have to think of the right answer for that and get back to you. Partial answer: securing a (paying) blogging position is an uphill battle, to convince a company that they need a blogger, and then to explain what a blogger does and why it's a good thing, and then to make them let me do it. OTOH, technical writing is a known quantity and people are happy to pay me for it. I just returned from a one and a half day vacation with my kids Saarya and Tal. It was nice. I wish I was more of an organized trip-planner, because sometimes we couldn't decide what to do next. But it was still nice. We stayed at the Holiday Inn in Tiberius, which gives you free access to Hamei Tiberius, a spa. You only get free access to the pools and sauna, not the massages and stuff. The rate was only 50 NIS more than staying at a much less nice bed and breakfast. Despite what I heard that everyone and his friend is on vacation and traveling on the week before Passover, this is not true; which is what I had originally thought. Things were fairly empty. Youth groups were traveling, but they all did hikes and stayed in the scroungy places. Meanwhile, we ate at one of my favorite restaurants, the Pagoda in Tiberius. It's Asian food and it's scrumptious. Best of all, I paid with a coupon from eLuna.com which allowed me to buy food at 2/3 the normal price. I didn't post anything from the Holiday Inn because I a) don't own a laptop, and b) the Internet kiosk at the hotel was one big security disaster. They have a credit card system for accessing the Internet. You open IE and all access points you to the payment page until you've paid. On the payment page, you enter your name, credit card details, etc. When I sat down to enter my details, I clicked in the name box and the name of the previous person who used the system appeared in the drop down box. Yes, the credit card details and everything else was there, too. I ran to the front desk who sent a security guy back with me to check it out. When I speak of security guy, I mean physical security, not computer security. "Oh, no problem," said security guy, who unplugged the machine and plugged it back in. When the system rebooted, IE's fields were no longer pre-filled. "See, Works now," said he, and walked away. I only hope he knows better about what he's doing with the physical security of the hotel. I entered a letter into the name box and hit return, and then checked to see if there was a way of wiping the personal information from the system. There was a menu item to do that, and it worked. So I probably could have used the system without worrying about that. But I decided that if they got this so very wrong, they probably got lots of other things wrong, too, so best not to bother. Of course, an administrator could have configured IE not to store information in fields, but I didn't have admin access and couldn't make the front desk understand this. Tuesday we hustled to Hertzelia so that Saarya could take part in a Code Guru competition for ultra-bright geeks. It's sponsored by IBM, Aladdin, Weizmann Institute, and others. He says he did well, but so did all the other kids, so he's not sure of the results yet. Meanwhile, Tal and I hung out on the beach, which was clean and free, even the parking. The water got up to my waist within the first few feet from shore, and then got no further than my shoulders for about half a kilometer out. It was all sandy and clear, too. Some of you who read this blog might not recognize all the games I mention. That's because I search far and wide to find games that are, in themselves, fun to play, and not simply fun if the people playing them are anyway having fun. Many of the games I enjoy are new games out of Europe, affectionately called Eurogames. As you read about a game on my blog, you might briefly wonder about picking up the game to play, but not know where to do so (if I didn't provide a link for the game in the post). The following places are where I go shopping. Not everyone has a friendly local game store (FLGS) from which to buy games. Even those who do may choose not to shop there if the proprietor isn't friendly or the prices are very high. I don't live in the US, but I generally ship to the US because that's where my relatives are. They keep the games for me until I pick them up. For those of you who live in countries with decent online or local stores (Israel isn't one of them, but UK and Canada are), you may have other, better choices for buying your games. They often have a seemingly random selection of games at 25% to 50% off. They sell not only from their own stocks but act as agents for hundreds of third-party stores, which gives them a decent selection of games. And their service and shipping is usually pretty good. They have ratings for games and sellers. And the fact that I get a small cut of the price every time you buy from them through my site doesn't hurt. There are local Amazon storefronts for several countries. Not only the biggest selection of games from every decade, but prices ranging anywhere from 90% off to 900% more than the original price of the item. Items are generally used, so you have to look at the recommendations for the seller before deciding to bid on an item. But in my experience, most sellers describe their products accurately and ship what they promise. Just make sure to read the description of the item AND payment and shipping terms closely. There are local eBay storefronts for several countries. Even better than getting cheap is getting "for free". Board Game Geek has two ways to do this. The first is to trade the games you don't want for those you do. You have to have something desirable to trade to begin with, but all you end up paying is an item you don't want and the shipping. The second is the "geekgold" auction. Many people offer games or cash for geekgold, which can be acquired either through contributing content to the site, or by selling items you don't want. BGG also has a marketplace; there are some decent deals, but most of the items are highly priced. There are dozens of online games stores serving up new games. Some stores are devoted to Eurogames and their community. Others are general board game stores, or CCG or RPG stores, with board game sections. Boards & Bits - A company in Washington run by Tom and Ben. I've personally ordered from them and find their prices, service, and selection all excellent. Boulder Games - A company in Georgia run by Jim. I've never ordered from them, but they have a similar reputation: inexpensive, good service, good selection. Jim is a strong and vocal advocate on behalf of his customers and dings companies on his site when he doesn't like their business practices even while selling their games. Fairplay Games - A company in Michigan run by Terry and crew. Again, I've never ordered from them but they have a good reputation. Game Surplus - A company in Pennsylvania run by Thor and Sara. I've ordered from them and found their service to be excellent, with good prices to boot. They even drew pictures on the side of my box wishing me a happy birthday. Thought Hammer - A company in Texas run by Alfredo and others. I've ordered from them and found their prices and service to be excellent. Funagain Games - Funagain is the best information site about games, second only to Board Game Geek. They give you info on weight, language requirements, ratings, and so on for each game. I have ordered from them, and their service is good and selection is excellent. Their prices tend to be higher than the other stores. Not coincidentally, they also run an affiliate program, and I make some small change if you buy from them via my site. Apparently higher prices equals the ability to run affiliate programs. All of these stores will give you free or discounted shipping (or a coupon equivalent) on large orders, and will generally have the games to you within a week. Another store which was a favorite of mine is Time Well Spent, but they appear to be on hiatus, possibly permanently. For those of you who might consider ordering a bunch of games at a time, and don't mind acquiring the German versions of the games - either because you read German, or the games you're ordering are language independent or also come with English rules - it may be worthwhile to order a bunch of games from a German store. Many of the best games originate in Germany, and the original versions are sold for a lot less in German online stores. Shipping is high for the first few games but doesn't get any higher if you order more games. I don't have any specific recommendation for German online stores, but you can peruse a list of them here. I'm looking for a new corporate blogging or technical writing position. Resume and references available upon request. This week and next will be sporadic posting. Today I am finishing my Passover cleaning. Tomorrow and Tuesday I will be on vacation with my kids. Wednesday Rachel returns, finally, along with Eitan and the dog; the latter of which hopefully won't get lost in the airport, again. Thursday and Friday are the run up to Passover preparations, Saturday is shabbat and Sunday is the first day of Passover (seder on Saturday night). Outside of Israel, Monday is also a non-work day, but in Israel I should be online Sunday evening. That Monday I'll be hiking with my synagogue somewhere. The Wednesday after is Games Day here. This last shabbat (yesterday) I didn't play anything, even though I had two opportunities. On Friday evening I needed to go to sleep early, so I left Nadine's house as she started setting up It's Alive for her other guests. On Saturday afternoon, I still needed to sleep, so I didn't make it over to her house to play 1960. The first time I discovered better games in an Israeli toy store, I got a little exuberant. What I write when BGG is down. Passover Greetings and reflections on real slavery. Did you know there are items on Amazon for 99% off? The flak about Oreilly's proposed Blogger Code of Conduct. Passover is centered around the idea of telling the story of the Exodus to your children. The Talmud bring many ideas to get children interested and keep them engaged in this story telling, many of which now form the core rituals of the Passover seder: breaking the middle matzah, dipping vegetables in salt water, and so on. Even the songs at the end of the seder were added as an incentive to children to remain awake until the end of the meal. Games are another good way to keep children engaged during the seder. You can bring a game out at an appropriate time during the story telling, when interest begins flagging, or as a reward for a lively interactive conversation. There are Passover versions of games that you already know: Word Search, Jeopardy, Bingo, Slides and Ladders, Go Fish. I created Four Sons as a story telling game to explore the idea of the four types of children. Let My People Go, Exodus From Egypt, and Exodus: The Game of Passover are three simple English Passover themed board games for young children. Good Reading, Ltd created four Passover themed games for children under their "Egypt to Canaan" series in the 1970s: The Plagues of Egypt, The Wilderness Wandering, The Ten Commandments, and The Conquest of Canaan. I don't know anything about these games or where to find them. There are also Hebrew Passover games for children, such as דיינו or פסח שמח, and many others. You can probably find Passover games in your language, whatever it is; drop me a line if you need help with this. After the seder, there are many games for grown ups not specifically about Passover but set in ancient Egypt. Some of these games are excellent, excellent games, including Thebes, Ra, Amun Re, Mykerinos, and Scarab Lords, to name a few. 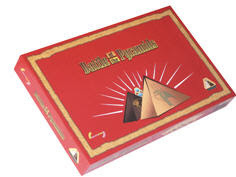 Additional games set in Egypt can be seen on this list of games on Board Game Geek. The latest Jerusalem Strategy Gaming Club session report is up. Games played: El Grande: King and Intriguant, Taj Mahal, Race for the Galaxy x 2, R-Eco. We try some variants on the El Grande expansions that are nearly as problematic as the expansions themselves. Purple Pawn is giving away a free copy of the game SET, just because. Go enter and win. And spread the word; tell your readers to add Purple Pawn to their blogrolls, feed readers, and bookmarks. PP is also still looking for more contributors; don't be shy! It's free, painless, and could lead to all sorts of big things, like OCD and CTS. Have you ever played a game and not felt good about it afterwards? It's a common experience. Like many other activities, playing games can transform us to higher spiritual and mental heights, or reflect the negative energies of our surroundings. It's not a tragedy when something doesn't work out as well as it should have or could have, but it's a bit of a tragedy if we don't learn from a negative experience and take steps to prevent its re-occurrence. A little planning goes a long way. Gaming, like exercise, eating, and sleep, is not an "accomplishment" activity, it is a "sustaining" activity. We play to center ourselves, feel at peace, refresh our spirits, and keep our bodies and mind tuned. If you are reluctant to play, think that you're wasting your time, or have more important things to do, it may not be the right time to play. You'll feel stress playing with people who give you stress. Don't force yourself to play games with someone who won't make the experience a positive one. If you're playing with a family member, say a child or a grandparent, you may have to bring the positive experience into the play yourself. Recognize that in this situation, the game is just a means to an end: a happy social experience. If the game is getting in the way of that experience, you need to work on your child's social skills or jettison the game. The right game can't be too long or too short, too complicated or too shallow, too easy or too frustrating. There's no right game every time for any one person, pair or group of people, or time. You may want a light game at one time an a heavy game at another. Unless you're in an official competition, don't go into a game angry, bent on revenge, or ready to win at all costs. You're goal is to enjoy the experience. Ensure that you have the allotted time necessary to finish the game. Ensure that you won't have too many interruptions (leave off the cellphone, if possible) or distractions (turn off the TV and have some dry snacks and drinks nearby). It's worth thinking about beforehand what to do if the game goes overtime or can't be completed. You'll also feel better about a game when you're decently fed and rested, physically fit, and in a clean quiet environment where nothing urgent is competing for your immediate attention. Keep a neat, organized stack of some favorite games within easy reach. Ensure that your games have all their pieces and your card decks are complete. Know the rules of the game before your start to play so you don't have to keep referring to the rulebook during play. If the game requires a lot of set up time, store components in separate piles in plastic bags in the game box to help cut down on this time. No one wins a protracted argument. State your case, but be ready to concede rules decision issues. You may not win the battle, but you will be paid many times over by maintaining a pleasant atmosphere. I promise that not every rule decision will go against you. Sure, it's hard to see a well-deserved win turn into a loss because of a bad ruling. But winning is internal, not external. You know you played well and won; you will cement that with good grace, not with arguing over bad rulings. Unless you're in an official competition, nothing sours a game like having to win for real because you can't afford to lose. Don't play for keeps; play to refresh. Every game deserves your best effort. Neither you nor your opponents will feel good if you didn't give it your all. If you're tiring, give gaming a break, or find a new game. If you're vastly better than or worse than your opponent, find a different game or introduce a handicap to even up the sides. This will keep the game interesting for all participants. Some games lend themselves naturally to handicaps, such as Go. Others require you to invent handicaps on the spot. In Monopoly, for instance, one player can start with more or less money or a property or two. In some games, the winner is known well in advance. The polite thing to do by all parties is to end the game and move on. But beware! In some games, players well behind can catch up unexpectedly. It depends on the game, how long you've been playing, how long the game still has to go, and what possibilities still exist for a comeback. Games are the quintessential arena for practicing good manners and sportsmanship. Playing fair is not merely about not cheating, but not taking advantage of rulings you can twist to your advantage, or confrontational play that would upset your opponent. If you're in the mood for a one on one killing game and your opponent isn't, see rule 2. A good game experience is one in which each player works at ensuring that their opponents have a good experience. You'll feel good if you've helped others to feel good with you. I've got a boat load of game books to read. I sent them, one by one, to a friend's house in the U.S. anticipating that I would eventually get there to pick them up. This didn't happen. So after two or three years of this I finally asked him to mail them all to me in Toronto, to take back with me to Israel. I accidentally acquired duplicates of some of the books. Also, some of the books deal with issues I was dealing with on the blog a long time ago but have since abandoned. So not all the books are useful to me. Luckily I generally buy books used at around $1 or $2 plus shipping. One of the first I got though is The Well-Played Game, by Bernie DeKoven. The edition that I read is the 1978 edition; the one pictured is apparently an updated edition. Many of you know Bernie from his Major Fun awards or Deep Fun blog. Bernie's been in the play business for a long time. In the 70s he ran his own play center, organized play dates for 250,000 people at a time, and taught and took part in the New Games Foundation. I met him for lunch a few months back; he was a real hippie back in the days, and he's still a bit of one today. The Well-Played Game was written in the 70s, and so is really infused with his hippie mentality and style. Present tense, spiritual, somewhat meandering, and embellished with personal anecdotes, what-ifs, and stories. The main thrust of the book is that we strive to play "well-played" games which have less to do with winning or rules and more to do with moments of feeling good about our play. One example would be volleying in table tennis without keeping score: a better player might handicap themselves to make it challenging for both players. The book examines the factors that tend to help or hinder this feeling of having played well, both on a personal and communal level. Two chapters in particular deal with issues about which I don't often read. Chapter 4 examines the way in which games, or play, provide help for players who are stuck, need hints, need to bend the rules, take a time out, or overcome interference. Chapter 6 discusses how games or play end: what happens when someone wants to leave early, loses, wins, or gets eliminated. It's an interesting and fairly quick read. His lessons about games are metaphorically about life, as well. I didn't play any games this shabbat. But I'm still trying to recover from a dinner with myself, one 15 year old boy, and nine - count'em - nine teenage girls. Shudder. Over the Passover holiday season, a number of gaming related conventions occur. My own club, the Jerusalem Strategy Gaming Club, will be holding a Games Day on Hol Hamoed Passover, as it always does. This year it will be Wednesday, April 23. Gaming is at my house. Call me at 0545-987034 for details. Bigor is an annual roleplaying con in Tel Aviv. This year it is from Tuesday to Thursday, April 22-24. Olamot is a fantasy themed con, also in the Tel Aviv area, running from Monday to Wednesday, April 21-23. Both will have fantasy related gaming, including CCG and some board and card gaming. A reader writes to tell me about GameIS2008, a full day event about interactive entertainment (aka video games) in Hertzelia. Another reader wants me to link to his new MMO turn based strategy game, Astrategic. A rare game of Scrabble I won against Rachel. About SET and why you will never win it. April Fool's and Passover disrupted my posting schedule in past years, otherwise. Game system - Bescres, an abstract game pretending to have a laser battle theme. Chess set for the blind - Including Braille markings on the boards and pieces, and recessions in which to place each piece. The recessions are drilled through to the bottom of the board, so that the pieces can be felt from underneath; I'm not sure why. 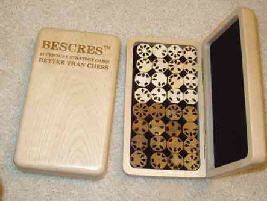 The preferred manner of the chess set is to provide two boards, one for each player with two complete sets of pieces. Thus, each player can hold his board in his hand so that the bottom of the board can be felt to take advantage of the lines which are provided thereon. Card game method and apparatus - A casino game. "A player receives three playing cards. The player arranges the cards in sequence and predicts where in the sequence a fourth card will fall." Gambling games - The idea is to allow casino players to take on the role of banker once in a while. The casino merely provides the facility and takes an entry fee. Thus bypassing the uneven odds of gambling, and thus possibly allowing the activity to occur in places where gambling is illegal. Alphabet challenge deck - Yet another card game with letters where you form words. 72 cards, includes 4 jokers and a card that lets you substitute letters in existing words. System and method for playing a bonus game - When triggered in some other game (it doesn't say when this trigger occurs), you get to play a poker game dealt from 13 cards, all of the same suit. Which will eventually be available at Play Frontiers, currently a parked domain (by some Israelis). An apparatus and a method of play in the practice of the present invention that are described below. An apparatus supporting the play of a casino table card game according to the present invention may comprise: A playing surface; A card-delivery device; A microprocessor operatively connected to the card-delivery device; Player controlled election identifiers that provide a visible signal of an election; At least two areas for display of at least partial card hands from which only one card hand may be elected for a wagering game by a player; The card-delivery device having at least one sensor thereon for sensing the presence of cards in a delivery area of the card-delivery device from which cards may be removed; The at least one sensor on the card-delivery device providing a signal to the microprocessor that a sensed set of cards has been removed from the delivery area; and in response to the signal, the microprocessor preventing players from entering a new election. The apparatus delivery device is preferably a card-shuffling device. The card-shuffling device may both shuffle cards and create sets of predetermined, preselected numbers of cards to be used in play of a card game. The card-shuffling device may be capable of being programmed to provide sets of cards of different numbers of cards to be used in the play of a card game. The apparatus signal to the microprocessor could comprise a signal that a sensed set of cards has been removed from the delivery area is in response to removal of either a) at least a portion of a player's hand or b) at least a portion of common cards. The signal to the microprocessor that a sensed set of cards has been removed from the delivery area may be in response to removal of at least a portion or all of common cards to be used in play of a game. A method of using this apparatus also constitutes a practice of the present invention. Got that? It's basically a card shuffler and dealer with some card detection software from Shuffle Master. They have another patent this month for a different card shuffler. Method and apparatus to play card game - Cards that have their suit or rank on their backs. Thus, some information is known about the cards dealt to other players. From a company called DM Innovations. Game played using a board and forming words - A strange hybrid game of rolling dice, forming words, and using pegs to keep score. Board game - Got me. Appears to be something called "The Franchise Game" which looks and plays something like Monopoly. The board is transparent and has slots for inserting the description of each of the spaces, so it might be some kind of DIY board game. During each round, each player will roll their die one time. The roll of the die determines the score achieved in each round. High low series gambling game - A high-low game with subgames. Card game - A blackjack game played to 33 points, with side bets on the resulting poker hand. Financial trading game - An electronic game where you buy stocks and then try to sell them at top price as their value randomly fluctuates. The following computers wished me a happy birthday: wizards.com, kellyclarkson.com (twice, for some reason), israelforum.com, damegames.com, zapak.com, wallashopsmail.co.il, and joy.co.il (offering a free bottle of wine with my dinner purchase). I'm rather surprised that so few computers love me enough to wish me a happy birthday. Must be because I tend to leave out as much information as possible whenever possible, and lie about it the rest of the time. But still; I must be registered at nearly a thousand online services by now. What's the deal, circuits-for-brains? And, if you're going to send me an automatic reminder that you're tracking my private information, send me an automatic birthday offer, too. In other birthday news, my American bank called to tell me that my credit card was compromised again. This follows it having been compromised last December. My Israeli card was also compromised in December. I use the credit card online, but so do other people. I think there has to be a key logger on my computer. If so, it would be my first ever infection. I've got firewalls, anti-virus, and anti-spyware running, and I'm usually pretty careful. On the other hand, my kids use the computer and who knows on what "OK" buttons they've been clicking. Time to wipe the computer and start with a new security plan. Twice I had to argue with people today to give them money. After a bit of argument about the price of the items on the bill (some too high and some too low), I handed them 40 NIS for my 39 NIS bill and received 11 NIS back. I kept my hand extended for quite some time and had to call the guy back twice to tell him something was wrong. He didn't understand either time. He had to call the manager before the problem was finally understood. While checking out, neither the person in front of me nor the cashier knew what the date was. I did, since it was my birthday, so I told them. They wished me a happy birthday. When finished, I checked my receipt as I always do, and noticed that they had rung me up 13 NIS short because they used the wrong code for something. I told the cashier, who told me that the thing rang up wasn't on sale anymore, which had nothing to do with my complaint. So we went to the manager and I eventually got them to realize that I still owed them money. "And it's his birthday, too," said the cashier to the manager. They eventually charged me the extra money and gave me two wineglasses "as a birthday gift". The cashier asked me why I bothered. I told her that it's not my money; I don't like to take another person's money and walk away with it. She didn't understand. "Nobody would lose any money if you just left," she said. Is there a moral payback for this, somewhere? It would be nice to think so. Maybe I'm just "a friar". People don't seem to go out of their way to give my money back when they take more than they're owed. The latest Jerusalem Strategy Gaming Club session report is up. Games played: R-Eco x 2, Robo Rally, Notre Dame, Settlers of Catan, Race for the Galaxy, Mr Jack. A new player makes a spectacular comeback in Robo Rally, and I lose RftG using a military world strategy. It's my birthday. I'm 39. 39 is the sum of five consecutive primes (3 + 5 + 7 + 11 + 13) and the sum of the first three powers of 3 (3^1 + 3^2 + 3^3). 39 is the atomic power of yttrium. There are 39 categories of activity prohibited on Shabbat. 39 is the actual number of lashes given by the Sanhedrin to a person is supposed to receive 40 lashes (owing to mercy). It's the number of Scud missiles which Iraq fired at Israel during the Gulf War. The Anglicans have 39 articles of defining religious statements. There's an Alfred Hitchcock movie The Thirty-Nine Steps and a Queen song 39. Pier 39 is a popular shopping center in San Francisco. Winning the web is running a giveaway contest, about which I already blogged once. In order to get more entries in the giveaway you have to jump through hoops: blog about it, sign up for services you don't need, write comments on other people's blogs, and so on. I'm down with a contest that goes on for a week or so, but this one has been going on for three weeks, and every day is another loony task you have to do to get more entries. After a certain point, it begins to feel like it's dragging on. Still, when you're giving away over $15,000 in services and prizes (less than half of that is actually useful stuff, but it's still a lot), you get to call the shots. Today's announcement is that someone just donated a $56,000 2008 Hummer H2 to the giveaway, which would be worth jumping through a few hoops for (except that it's April 1). We can accept games that breed division, and conflict, and cynicism. We can play games only as spectacle – as we did in the Halo 3 release – or in the wake of tragedy, as we did with Super Columbine Massacre - or as fodder for the nightly news, as we do with Bully. We can show these violent games on every channel, every day and talk about them from now until the election, and make the only question in this campaign whether or not the American people think that Grand Theft Auto has artistic content or sympathize with its publisher, Rockstar Games. We can pounce on some gaffe by a Hillary supporter as evidence that she’s playing Manhunt 2, or we can speculate on whether white men will all flock to John McCain in the general election regardless of his past stance on Mortal Kombat. But if we do, I can tell you that in the next election, we’ll be talking about some other video game. And then another one. And then another one. And nothing will change. That is one option. Or, at this moment, in this election, we can come together and say, “Not this time.” This time we want to talk about the new board games that are providing for the future of black children and white children and Asian children and Hispanic children and Native American children. This time we want to reject the cynicism that tells us that these kids can’t learn to sit around a table together and discuss strategy; that those kids who don’t look like us are in somebody else’s game group. The children of America are not those kids, they are our kids, and we will not let them fall behind in the skills of placing the robber, managing the castillo, and choosing which cards to discard to settle a non-military world. Not this time.